I hate you! That photo, now i want sugar .. ahh gees..
You must not go to Disney very often. I wish the veiled maidens would come back, was horrible when they took those away. No sugar, papa. Ha ha ha. Not on the menu anymore. Biggest bummer of my trip. Hate to break it to you, you can't get used to anything on that menu. One year they had it perfect with this spot pie with spins he and potato with an amazing crust and this really good cheesecake and it wa shone just as quick as it was added to that menu. Boooooooooo! 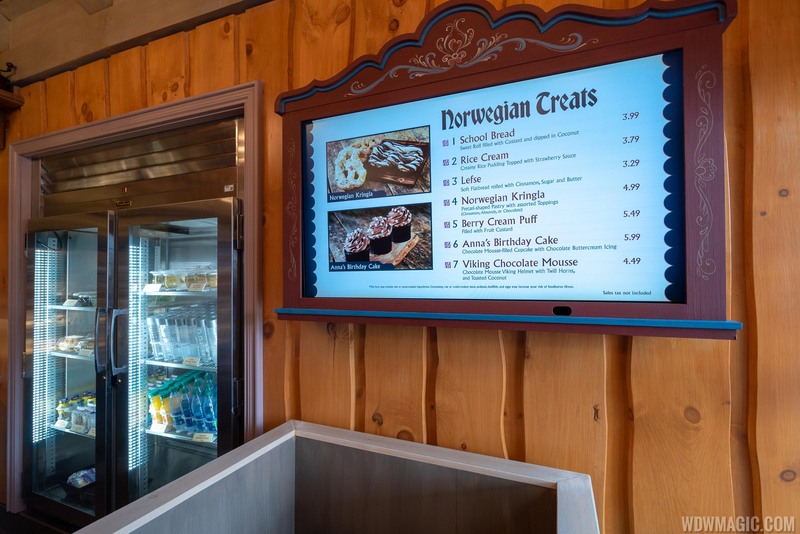 That menu board looks like a screen type so I'm hoping the menu will change from time to time. Cloudberry Horns ( later called a 'Troll Horn' ) and the ol' Berry Tarts were my favorites of yore. Just now noticing they have been discontinued. The Berry Tart was bliss. Atop a mini pie crust, filled with vanilla pudding and crowned with a overflowing selection of blueberries, red and black raspberries, and sliced strawberries. Cloudberry Horn was a cream filled crispy croissant-like pastry. Third favorite is the Almond Sweet Pretzel, which used to be huge in size. I'll be stopping by this week to view the new setup and selections. I agree with those above. The loss of the troll horn is a disappointment. I am hoping that the bakery case itself may have more options than are listed on the menu. Looks like a nice improvement - better functionality and retained the original aesthetic. Should help with crowd flow and improve the user experience. So, glad to see they retained the lovely outside seating area. Anyone know what backstage space was “lost” inside the building to accomplish the expansion? I dont know if any backstage space was lost per say, but the first section of puffins roost shop was taken for it. Thanks for the info. Do you know how the traffic flow pattern was altered for Roost and the rest of the shops there? Does it work well? Does anyone have pictures of the finished refurb? I love Kringla, school bread is my favorite and their sandwiches are great! That was posted just one page back. Oh, thank you, I guess I missed it. It's hard to tell from the photo's what it will feel like inside. Has anyone gone in? Is it a lot better?